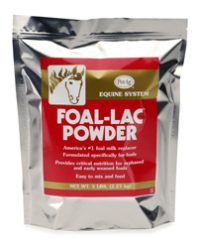 Foal-Lac Powder is a nutritionally complete powder that is reconstituted with water for feeding orphaned or early weaned foals. Formulated specifically for foals. Foal-Lac simulates the nutritional composition of mare's milk. Foal-lac is highly palatable and can be bucket or bottle fed.